Here are six supplements shown in studies to improve diabetes-related health. Note: This list does not include herbs or plant medicines, only six of the many supplements you can take as a pill or a powder. Low levels of vitamin D are linked with both kidney and heart failure, two major diabetes complications. Vitamin D also strengthens bones and teeth and improves insulin function. A review of The National Health and Nutrition Examination Survey (NHANES) in 2010 found that 41.6% of Americans were deficient in vitamin D. You can get more vitamin D from sunshine, fish, fortified milk, and supplements. Dietitian and diabetes educator Amy Campbell MS, RD, LDN, CDE, says vitamin D3 supplements are better than D2. Different medical experts recommend varying amounts of this vitamin, from 600 to 5,000 units a day for adults. The current Recommended Dietary Allowance (RDA) is 600 units for people 14–70 and 800 units for adults over 70. Good bacteria can lower glucose and insulin levels. They help prevent urinary tract infections and may help prevent yeast infections, which are common in people with diabetes. Having the right bacteria in your gut can improve insulin function, bowel function, and even contribute to weight loss. Probiotic foods include yogurt, kefir, kimchi, and olives in brine. Many people do not like the taste of these foods, or find them hard to obtain. Fortunately, a wide variety of probiotic supplements are available. You may have to experiment or consult a dietitian to find what kind works for you. This compound is found in various parts of certain plants. It is widely used in Asia for diabetes and gastrointestinal conditions. Chinese studies have found berberine similarly as effective as metformin in reducing blood sugars. It improves insulin function, decrease glucose production by the liver, and slows the breakdown of carbohydrate in the gut. It has been found to improve nerve pain (neuropathy) and kidney disease. Berberine can cause stomach cramps and other digestive side effects at high doses. It is usually taken with meals. Naturopathic doctors often recommend a dose of 500 milligrams, two or three times a day. Sleep is crucial for good health, including good glucose levels. Melatonin is a hormone necessary for sleep. Low melatonin levels are associated with insomnia and can impact glucose control. Given exposure to sunshine, your body can produce its own melatonin. Food sources include many fruits and vegetables and nuts and seeds, but melatonin supplements may help. Although some studies have found that melatonin supplements raised glucose levels, others, like this Israeli study showed that A1C levels went down in people with diabetes who took 2 milligrams of prolonged-release melatonin two hours before bedtime for three weeks. ALA is a powerful antioxidant that increases insulin sensitivity. Antioxidants protect blood vessels by neutralizing molecules called “free radicals” that damage cells. ALA helps get glucose into the muscles, improves diabetic neuropathy, and sometimes helps with weight loss. You can get ALA from beef, organ meats such as liver, spinach, broccoli, beets, and potatoes, but ALA supplements will get your levels up faster. This mineral lowers blood sugar, relaxes muscles, and helps with many body functions. It lowers the risk of heart attack and stroke. Food sources of magnesium include leafy vegetables; certain berries and tropical fruits; whole grains; beans; nuts; fish such as mackerel; many herbs and spices; and dark chocolate. Despite all these sources, the average American’s intake is half the recommended daily allowance (RDA) of 320–420 milligrams per day. You can find NIH fact sheets on these and many other dietary supplements here and on individual products here. The database includes information on dosage, health claims, and cautions. According to the NIH, the FDA regulates supplements as food, not as medicine. Most likely no one has checked that the bottle you’re buying contains what it says it does, or in what dose. Amy Campbell says to buy a supplement that has a “USP Verified” seal. 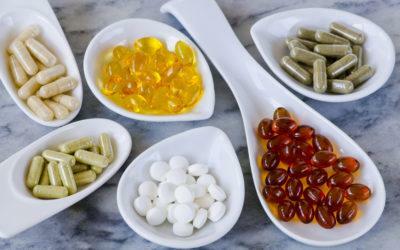 WebMD advises us to discuss supplements with our health-care providers. Ask a pharmacist if your supplement might interact with medications. As with any new addition to your program, you probably want to monitor more often after starting a new supplement. Some, like ALA, have the potential to take your sugar too low. As with new medications, give supplements a fair chance. It might take a month or two to see any benefits. Supplements might help you, but they cost money. Research carefully; see if you can get the nutrients from food; check with an expert. You might find the right supplement makes a big difference for you.